The grand re-opening of Westfield Century City mall attracted droves of fans to see Joe Jonas and his band, DNCE, play at the newly renovated mall’s 1000-seat Atrium. But it was the opening act, a row of vitrines facing Santa Monica Boulevard, installed by Riot Creative Imaging, that gave visitors the first glimpse of what this $1-billion, two-year renovation was really about. Amidst a changing competitive landscape, e-commerce giants have forced mall operators to rethink their strategy for attracting customers. At Westfield Century City mall, that means targeting wealthy shoppers with features like private lounges and elevators and personalized parking spots. Custom-designed furniture is also placed throughout the dozens of high-end retail stores. But Westfield’s transformation didn’t end there. Luxurious interior features were part, but not all, of what made Westfield’s image reinvention so successful. 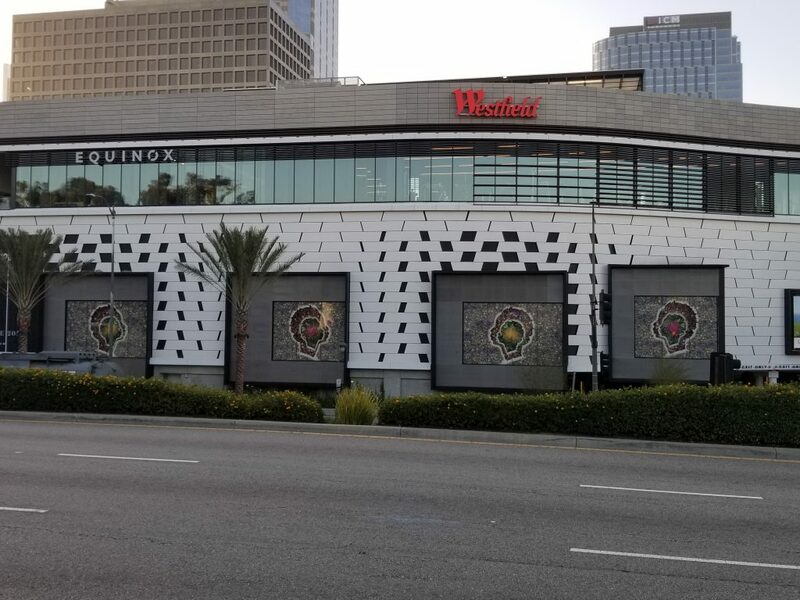 Adorning the front of the mall – facing out onto the iconic Santa Monica Boulevard — several 20-foot by 20-foot vitrines showcase a display of culture, art, and event promotion that changes every one to two months. Riot originally installed these vitrines in less than a week, and each time one of the stores decides to rent out the display, Riot returns to update the vitrines. After Westfield and the store iron out the details of the artwork to be placed, Riot jumps into action. In just one to two days, the Riot team prints and laminates each panel, then works through the night to install the new artwork. If it sounds like magic, that’s because, for the shoppers entering this 21st-century mall, it is. Miguel Mares, color manager at Riot likes to say, “We make the impossible happen for our clients,” and he’s not far off. 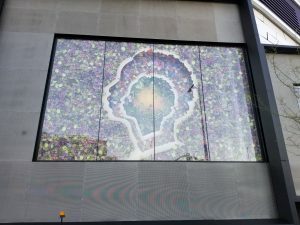 Each time Westfield needs new artwork installed, Riot is there. And despite the tight 24 to 48-hour deadlines, they make it look easy to source the right materials, print perfectly aligned panels, schedule the right installation specialists, and coordinate delivery. It’s a testament to why high-end clients trust Riot to produce and install perfect graphics in narrow timeframes. If you’d like to see more examples of amazing work like this, head over to Riot’s Inspiration Board to browse photos of their various projects.